‘Koffee With Karan’ is the most controversial show on television and season 6 got premiered on October 21. 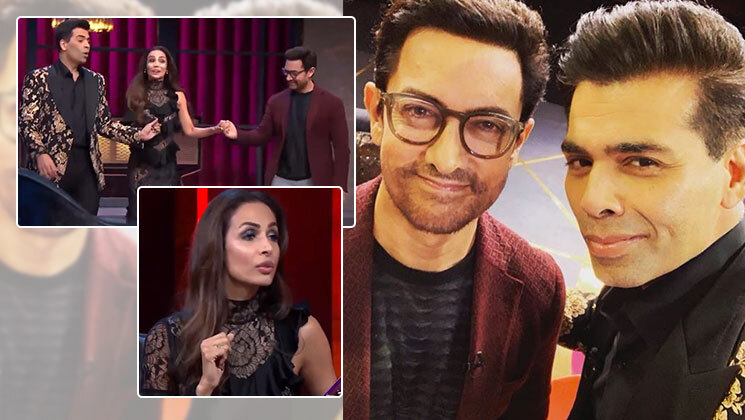 Yesterday, the second episode was aired when Ranveer Singh and Akshay Kumar graced the couch. The episode was super hilarious and why not? It had the two most energetic actors of Bollywood. The third episode, which is getting aired next week i.e on November 4, will see Aamir Khan as a solo guest on the show. Aamir Khan, who happens to maintain a low profile, is seen spilling the beans on his personal lives in a segment called ‘Koffee Shots With Karan’. All credit must go to Karan Johar who managed to wriggle some of the secrets out of Aamir’s life as well. In the preview, we see Karan Johar asking some controversial questions and Aamir is replying to those without any hesitance. The ‘Dangal’ star confessed on cheating in a relationship and also admitted that he had taken shower together with his wife Kiran Rao. That’s too much information from Aamir, isn’t it? Karan then welcomed Malaika Arora, who is making a special appearance on the show. She is going to judge the rapid-fire round for Karan Johar and Aamir Khan. Malaika asked a tricky question to Aamir related to Salman Khan and Shah Rukh Khan. To know what Aamir replied, we have to wait for November 4 for the episode to get aired. Till then, watch the teaser. The upcoming episode seems to be interesting, where we will see Aamir Khan baring everything.